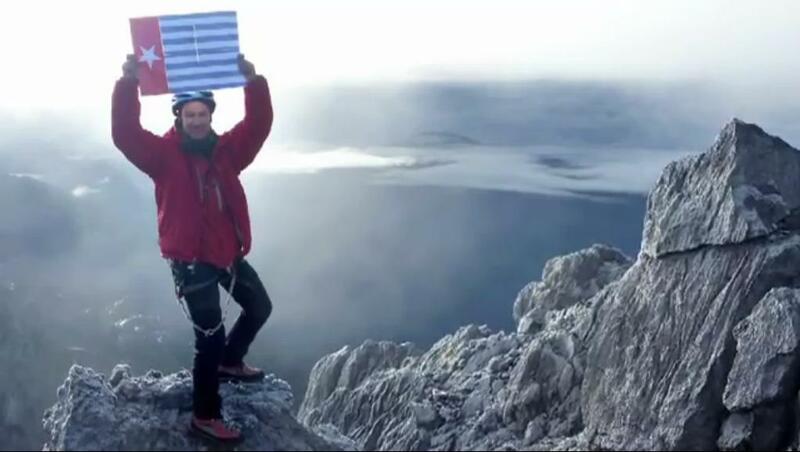 Christian Welponer, the world- famous seven summit climber from South Tyrol, an autonomous region of Italy, has summitted the peak of Puncak Jaya where he raised the banned Morning Star flag in solidarity with people of West Papua commemorating the 50th anniversary of Papua’s Day of Stolen Independence on December 1. Indonesian security forces on November 30 threatened to “Shoot to kill on sight” any Papuan who raises the Morning Star flag, or hold any event that affirms Papua’s independence from Indonesia. Indonesia applies charges of treason and Rebellion – or Makar – to any displays of political expression that speak of self-determination or an independent West Papua. Significant crackdowns by security forces on unarmed peaceful protestors are expected across Papua on December 1, and Welponer has dedicated his flagraising to all Papuans fighting for their freedom on this day. West Papua Media has been provided with exclusive imagery of the Welponer holding the Morning Star atop Papua’s highest peak, also the highest peak of the Australasian (not Asian) continent, sitting at 4,884 metres above sea level. Named Puncak Jaya by invading occupation forces from Indonesia in 1969, known for hundreds of years as Carstensz Pyramid, and known for up to 45,000 years by local Amungme people as Nemangkawi, the peak is adjacent to the massive Freeport gold and copper mine of Grasberg. Military security is exceptionally tight around the mine area. In the video, Welponer compares the struggle of the West Papuan people to the struggle of his people of South Tyrol, who won Special Autonomy status from Italy in 1972, and delivers a heartfelt message of solidarity for Papuan people for December 1.